Geometry problem, borrowed and extended. Try it ! In the diagram is rectangle ABCD with height 10 cm. 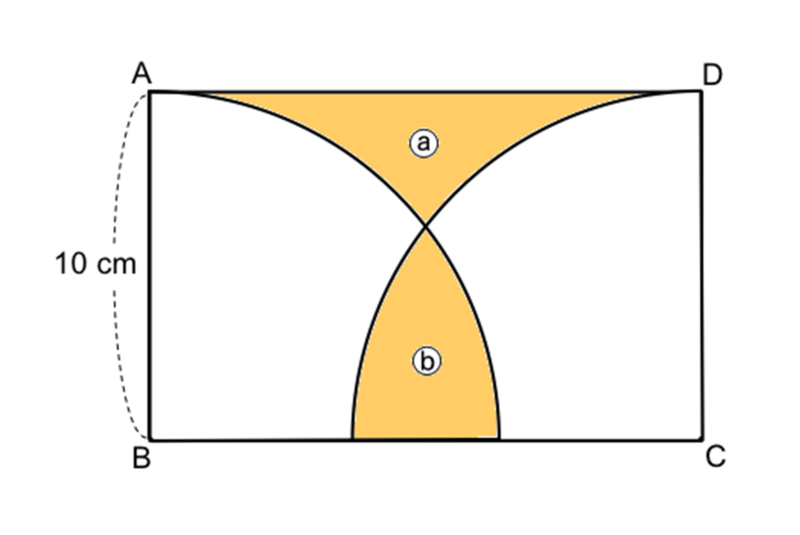 An arc with centre at point B is drawn from point A to side BC. An arc with centre at point C is drawn from point D to side BC. Given that the shaded (coloured) regions ⓐ and ⓑ have equal area, determine the length of BC. It could be a two line calculation ! Numberwarrior’s concerns are about the language and the formal properties of congruence and I agree with him on this. My concerns are about the stated claims of the CCSS to specify the “What do the need to know/understand/be able to do”, and the PARCC test which says “This is HOW you do a proof”. 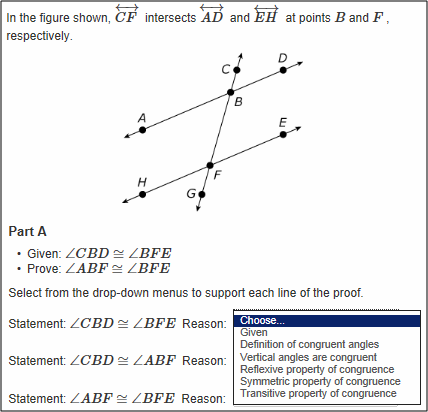 In this particular example there are other ways of proving the assertion, not least those using the definition of congruence by rigid motions. 2:There is a translation of line HE to line AD, as they are parallel. So the translation of H to H’ puts H’ on the line AD, and so angle H’BF is congruent to angle ABF. 3: But angles are preserved by rigid motions, so angle H’BF is congruent to HFG, and therefore angle ABF and HFG are congruent. So, if I chose to teach about proof using this approach (my “HOW”) the students won’t even understand the question. Test items MUST be “Method Free”. Also, the so called Reflexive, Symmetric and Transitive properties of congruence are no different from a=a, if a=b then b=a, and if a=b and b=c then a=c for numbers, and in both situations these are so STUNNINGLY obvious that it is cluttering up the minds of the learners to burden them with this sort of stuff. It is clear to me that this is a contribution to the CCSS from the sole pure mathematician on the committee. A simple diagram with original axes in blue. This will be the case for any original point – the coordinates of each one of them will be the same as the coordinates of their new positions under the translation (in the original coordinate system). 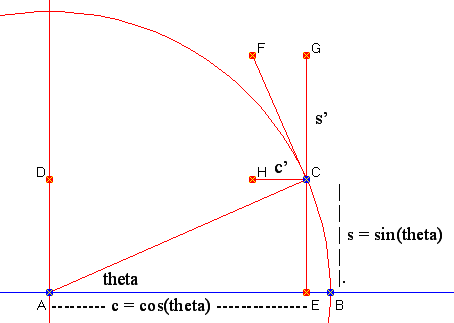 rotation about the origin through an angle theta is equivalent to a rotation about the origin of the axes through an angle minus theta. So there is a one to one correspondence between rigid motions and change of axes (scales preserved). 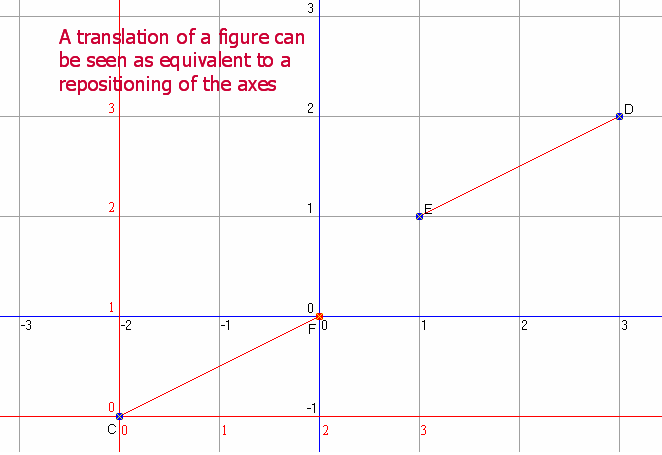 On a lighter note, it does seem easier to rotate a pair of axes than rotating the whole plane ! ! ! It would be slightly more satisfying to set theta = f(t), where t is the time variable, but since dtheta/dt cancels out it doesn’t matter. 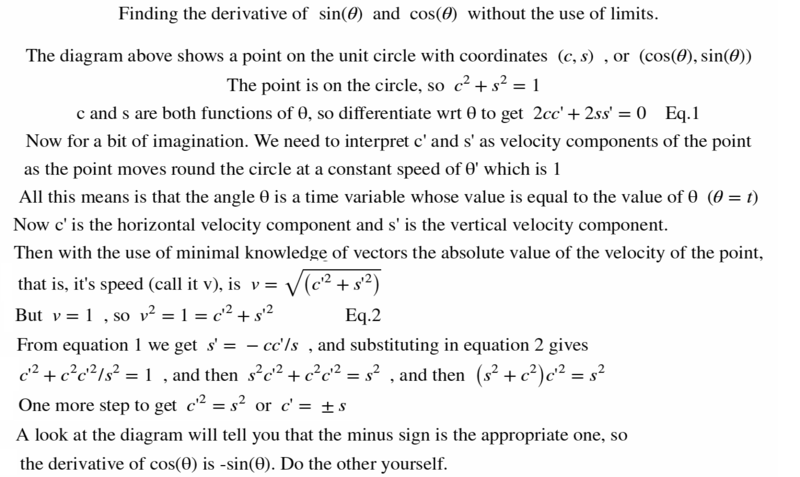 I thought I would write a computer routine to check if two figures were congruent by the CCSS definition (rigid motions). One day I will post it. The most important thing was to be specific as to what is a geometrical figure. You can read the CCSS document from front to back, back to front, upside down and more, but NO DEFINITION of a geometrical figure. For the computer program I decided that a geometrical figure was simply a set of points. My diagram may show some of them joined, but any two points describe a line segment (or a line). So a line segment “exists” for any pair of points. 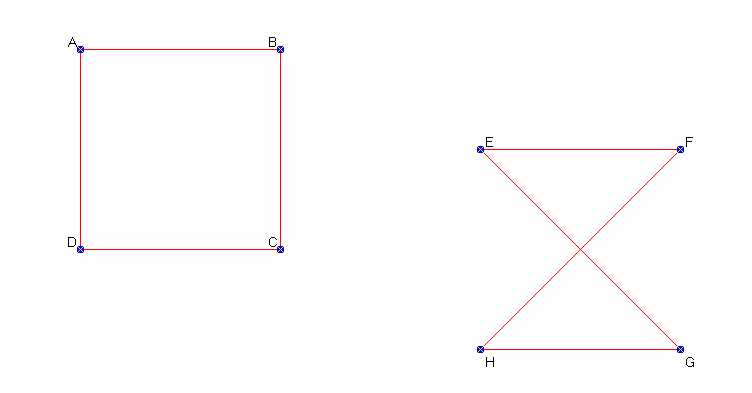 The question is “Are the two figures shown below congruent or not? Idly passing the time this morning I thought of a – b = a + (-b). Fair enough, it is the interpretation of subtraction in the extended positive/negative number system. But -(b + c) = (-b) + (-c) is guesswork. I cannot see a rule to apply to this situation. It’s not surprising that kids have trouble with negative numbers! Do we just assert that the distributive law applies everywhere, even when it is only defined with ++’s ?